This past weekend, Bucknell was supposed to travel to the Bald Eagle State Park, PA to race Penn State and ARMY in the annual Faunce Cup on Saturday, April 6th. However, due to unsafe launching conditions for crews and equipment, the race had to be canceled this year. There are currently no plans to reschedule the race at this time. 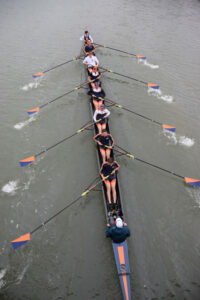 New to the calendar this year for Bucknell Men’s Crew was the River Cup, hosted by Lehigh University on Lake Nockamixon in Quakertown, PA on Sunday, April 7th. The River cup is between Lehigh University and Lafayette College, with Bucknell and Mercyhurst as guests. Set up similarly to the Cayuga Duals, there would be an AM and PM race for the Men’s 1V boats, with the winners in the morning determining the competition in the afternoon. The weather was extremely calm with flat water for all morning racing that turned into a quartering tailwind by mid-day. This was a 2000m race with a floating start. With an early start to the day, the Men’s 1v was the first race to kick off the morning with the Bison pulling up to the starting line with Mercyhurst. Getting off the line with a clean start, Bucknell pushed bow ball to bow ball with Mercyhurst for the first 500m. Mercyhurst proved to be the stronger crew and was able to pull away to cross the finish line (5:44) just ahead of the Bison (5:52). In the other MV8 race was Lehigh 1V and 2V with Lafayette, where Lehigh would take the win, sending Lafayette to Bucknell in the afternoon. Here, the Bison would stick ahead of the competition and grow open water to finish with a time of 5:34 over Lafayette’s 5:47. Given that Bucknell was the only team to field a 3V, the M2V8 event would have both the Bison’s 2V and 3V entered. For the morning race, Bucknell would face up against Mercyhurst. All crews would take off the line with an even start, and both Bucknell crews taking a slight lead over Mercyhurst. The Bison 2V eventually gained 5 seats over Mercyhurst, who was able to make up ground on the 3V. In the last 500m, Mercyhurst would start their sprint, catching the Bison 2V and nosing over the line by less than a second ahead both Bucknell boats. Mercyhurst posted a time of 5:49 over Bucknell’s 2V (5:50) and 3V (6:13). All three crews would see each other again later in the day with the addition of Lehigh’s 2V. With Bucknell’s 2V hot on the heels of Mercyhurst, they were eager to see them again with the confidence they could react and match the sprint when Mercyhurst was to make a move. In the first 4-boat race of the day and a slight wind picking up, Bucknell’s 2V took a clear dominance of the race early on. Not wanting to loose the lead again, they pushed for open water coming into the last 500. Bucknell’s 2V (5:44) would take the win over Mercyhurst (5:48), Bucknell 3V (6:01) and Lehigh (6:17). The Men’s Varsity 4+ event had a unique situation for the day’s racing with the morning’s event being broken up into pairs. Bucknell would have both an A and a B entry for this race to go up against Mercyhusrt once again. Off the line, Mercyhurst took an obvious half-length lead over Bucknell, but ended up veering into Bucknell A’s lane, causing all crews to shift several times during the race. Mercyhusrt would take a clear win (7:08) over both Bucknell A (7:31) and Bucknell B (7:32). Later in the day, the Men’s varsity 4+ event was combined into a 3-boat event for Bucknell, Lehigh and Lafayette. This was another tight race off the line that would see Lehigh shifting slightly into Bucknell’s water. With Lehigh having an obvious lead, Bucknell’s protest did not change the resulting time with Lehigh (6:23) taking the win over Bucknell (6:28) and Lafayette (6:45). It was a great day of racing for all crews and is an event the Bucknell Men’s Crew looks to keep on their calendar for years to come. Full results and times from the race can be found HERE. Up next for the bison is the Kerr Cup in Philadelphia, PA on April 20th.